I’m really pleased with how our guys are competing around the ball and how they are defending at the moment. THE CASEY Demons had its final practice match ahead of the VFL home and away season on the weekend, with a number of Melbourne-listed players performing well against Geelong. Although the result was inconsequential, the Demons claimed a 28-point victory and senior coach Jade Rawlings was impressed with what he saw. “I’m really pleased with how our guys are competing around the ball and how they are defending at the moment,” Rawlings told Melbourne Media. After another successful hit-out, Rawlings said the Demons’ pre-season should have them primed for Round 1. “We’ve been really pleased with being able to play three practice matches against a variety of opponents and methods of footy,” he said. It was a great opportunity for Casey to get some time into its young players, with Oskar Baker showing great signs of improvement in his second season, and Toby Bedford and Kade Chandler fitting in well. “They’ve been terrific so far – I’ve really enjoyed coaching them,” Rawlings said. Another positive to come from the day was the return of Tim Smith. Smith had been sidelined by a calf injury but looked lively up forward with five shots on goal, while Harry Petty also recovered quickly from a foot complaint to run out the game. 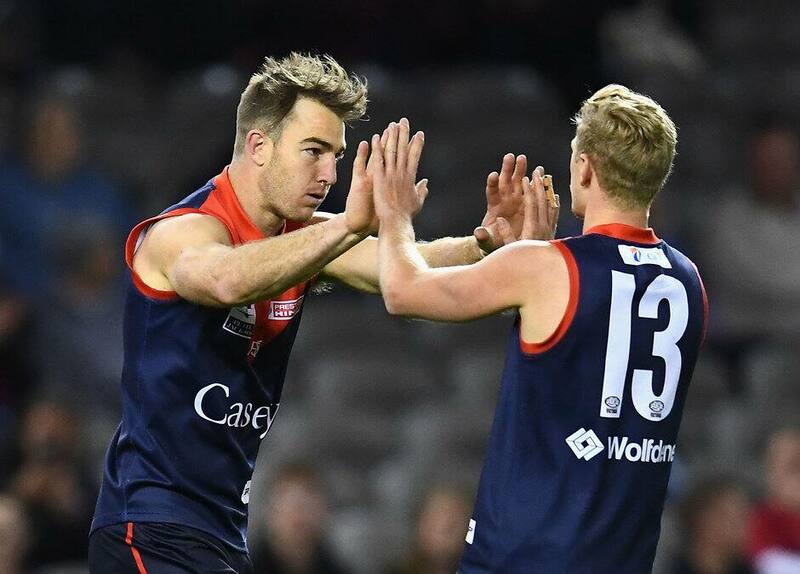 The Demons benefited from the influence of a number of Melbourne players, with Declan Keilty, Braydon Preuss, Billy Stretch, Corey Wagner and Josh Wagner all among the best performers for Casey. Keilty, currently on Melbourne’s rookie list, is a player who has continuously improved in recent seasons after initially being drafted to the club from Casey. “We’re very happy with Declan playing forward,” Rawlings said. “He’s a genuine target for us when we move forward, he’s very accurate with his goal kicking and if he doesn’t mark it, he always brings the ball to ground. Preuss was another big-bodied player to perform for the Demons, with the 206cm recruit proving his value both in the ruck and around the ground. “I’m really pleased with how Braydon is going,” Rawlings said. “He’s improved week-to-week since he played his JLT game against Richmond … and each week he’s getting better. He has a real presence out on the ground, both with the way he’s going about it but also how he’s linking with his teammates – the players love playing with him. Since returning from a toe injury over the summer, Stretch has continued to build his game and looked to be at his best on the weekend. “Bill was in the best few players on the ground,” Rawlings said. “All the things we love about Bill he’s bringing to the table. He’s putting time into the development opportunities and they are starting to come out in his game at VFL level. After making his debut for Melbourne in Round 1 of the AFL season, Wagner was left out of the senior side to face Geelong. But the 22-year-old responded in fine fashion in the VFL on Saturday. “He took ownership of why he missed out and then tried to apply everything he needs to to get back up there," Rawlings said. Wagner hasn’t played a senior game since Round 5 last season but is always a strong performer for Casey. The reliable defender continued his form on Saturday and had a big impact for the Demons. “Josh is playing genuinely tough football at the moment,” Rawlings said. “He’s playing at half-back and always looks for contests. He’s someone who our players really look to for leadership with how he goes about his footy and his instruction out on the ground.